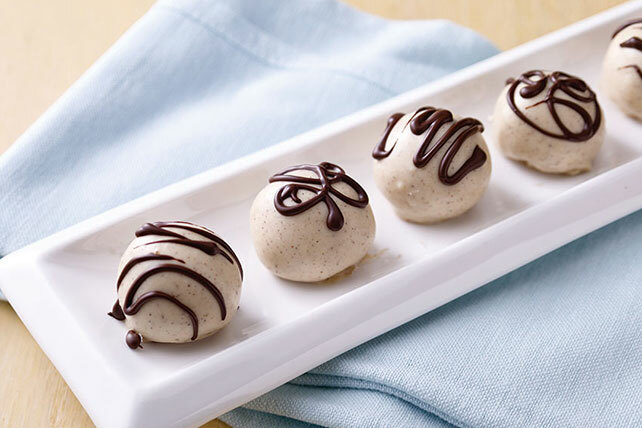 Honey graham crackers and honey nut-flavored cream cheese give these white chocolate-dipped cookie balls their sweet and subtle scrumptiousness. Mix white chocolate and cinnamon until blended. Combine cream cheese spread and graham crumbs; shape into 24 (1-inch) balls. Dip in white chocolate mixture; place in single layer in shallow waxed paper-lined pan. Drizzle with semi-sweet chocolate.